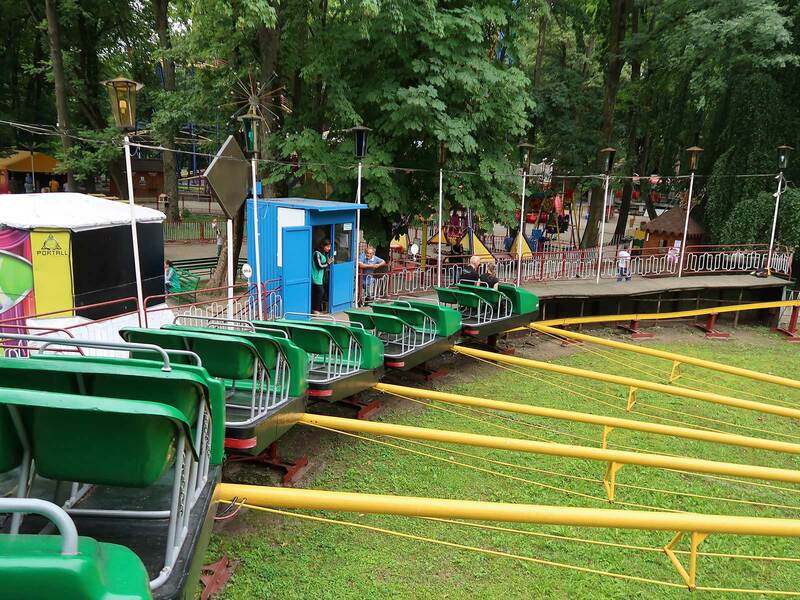 Yesterday morning featured a trip to the Belarusian city of Orsha, home to another Children's Park. Unfortunately the weather gods were not on our side, and while the staff made valiant efforts to assist us there was nobody on site qualified to run the Gusenitsa, a Wacky Worm of indeterminate provenance. Though the language barrier again proved a challenge, their body language suggested that they were genuinely sorry at being unable to assist, which cushioned the blow somewhat. The day went from frustrating to challenging when the time came to return our rental car at Minsk Airport. The petrol station at the airport apparently had a technical problem, requiring us to drive several miles away to refuel. Then security staff refused to allow us to park the car in the location where we'd been told to bring it. Bruno moved it to the short term car park, but then the rental office told us that we'd taken too long after arrival at the airport and that they'd need to charge us for an hour's parking. They also said that we'd need to wait for the person who would check the car for damage, as he wasn't there at the moment. There wasn't enough time to do that after all the messing around, so we went to check in for our onward flight. Fortunately he'd materialised by the time the formalities were complete. Our destination was the picturesque Ukrainian city of Chernivtsi, located in the west of the country close to the borders with Romania and Moldova. We'd chosen the off-beat location purely because of the presence of two locally built coasters within walking distance of each other. (At one stage there might have been a third tick in the nearby city of Boiany, a short drive away, but that installation was taken down at some point between 2006 and 2010. Though there is no evidence either way it is entirely possible that one of the two versions in the area today began life there). 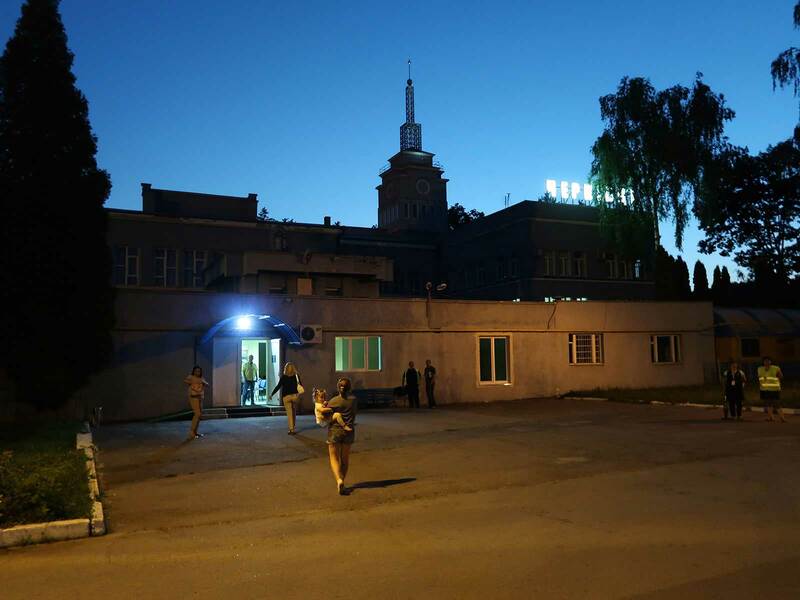 I was quite excited to land at Chernivtsi International Airport as it was by some margin the smallest airport I'd been to in my travels, a fraction of the size of the already minuscule Kerry Airport. The place had just one gate and no baggage reclaim facilities, as we found out to our cost when we walked through arrivals expecting to find one. Instead, inbound passengers were expected to wait on the tarmac next to the plane while the various suitcases are unloaded. After realising our mistake we pleaded foreign tourists to the nice man at the security door who kindly allowed us to retrieve our luggage. With that sorted we were met by Vasyl, a local guide who drove us the short distance to the Hotel Premium. He also pointed us towards a superb gastropub next door with an English-language menu that served top notch steaks at extremely low prices by European standards. It was only later that we realised that the costs reflected an enormous drop in value for the local currency thanks to the ongoing war in the Donetsk area. Flight schedules necessitated a full day in town, and with that in mind we hired Vasyl to take us on a walking tour of the city with side trips to the two coasters. His assistance made things straightforward, and I'm glad that we took him on, as we saw quite a lot more than we would have managed on our own. He went out of his way to help us, too; when it became apparent that the rides at Oktyabrskiy Park were down due to rain he managed to obtain the phone number of the owner, and passed on our offer of a handsome cash bribe to come and start things up for us after the weather cleared in the late afternoon. The response was initially positive but subsequently failed after it became apparent that the operator had turned his mobile phone off, robbing him of a payday and us of an obscure credit. 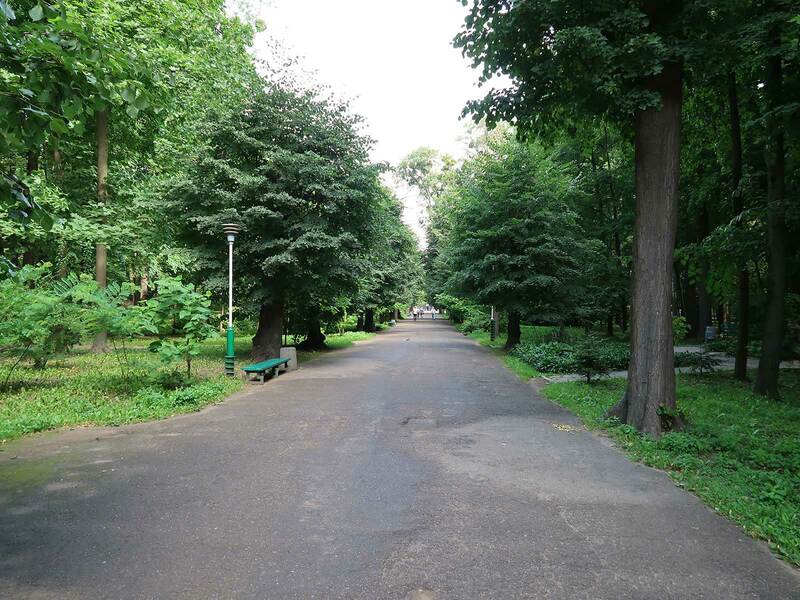 Central Park is a classic example of the Soviet school of municipal park design, with an impressive tree lined avenue at its entrance and a brisk ten minute walk from there to the amusement ride area. We arrived to find a hive of activity, with at least twenty uniformed personnel cleaning and preparing the various machines. Vasyl went over to one of them to get the lay of the land, and learned that we were half an hour early for the scheduled opening at 11:00am. This gave us a good window of time to take photos, and we made the most of it. We made our way to the ticket desk at the appointed hour, and then onwards towards Hoverla (#2343), one of eleven known installations of a production model coaster from local firm Analog/Sarmat named after the tallest mountain in the Ukraine. Only one version was sold outside of the former USSR, and it was removed after just one season, raising obvious and troubling questions about the calibre of the design. That, perversely, was one of the prime reasons why we were so eager to experience one for ourselves, reinforcing the fact that coaster enthusiasts are a little crazy. The layout occupies a footprint that is perhaps ten percent larger than the well-known Pinfari ZL42, but somehow manages to feature a nine-car train seating eighteen in a very open manner reminiscent of the updated rolling stock on Titan Max. The station is set well off the ground, allowing a gravity-driven dip and curve before the diagonal tyre drive lift hill. The turn at the apex is banked in the wrong direction, similar to the Pax-built wild mice, and this leads to a drop straight into the tight vertical loop. The comfort level through the inversion, though not exactly Schwarzkopf, was also not awful in the front of the train; the only real moment of jarring was a sharp left turn immediately afterwards whose fabrication was not as good as it might have been. The layout was completed by a few more turns and a small climb back into the station. There is one important issue with the ride that western visitors should bear in mind, namely the clearances, which do not meet international standards. There is plenty of vertical space above the train, hopefully eliminating any risk of decapitation, but quite a few of the supports are perilously close to the track and well within what would normally be considered the safety envelope. The operator warned us to keep our hands inside the car prior to dispatch, and the message was pertinent; there were about five points on course where I was confident I could have hit a support if I'd wanted to. (It's also worth noting that the ride has extremely narrow turnstiles at the entrance and exit; those of a more corpulent disposition would likely not fit through them). We were given two laps for our money, and subsequently went back for two more, choosing the back in a demonstration of sadomasochistic machismo. In this location the ride was certainly more aggressive than it had been in the front, but once again the experience was something that I'd have willingly repeated. I found myself concluding that the design's lack of success elsewhere in the world was purely down to the clearance issues rather than poor build quality. It seems likely that the engineers who produced the original drawings came up with something that complied with local regulations without planning for the fact that they might want to export it some day. We also tried the Ferris Wheel and a locally-built Tumble Bug, the latter appearing at first glance to be far more interesting than it actually was. It was effectively neutered by two things: first, the top speed was too low for there to be any airtime; second, there was a continuous vibration throughout the ride that induced a low order headache after twenty or so laps of the course. Our German friends labelled it as langweilig, which I'd argue is a generous description; zwecklos (or perhaps scheiße) would seem to fit better.